Magna Science Adventure Centre was one of the most spectacular and innovative projects undertaken by Lindstrand Team. It had more than 300,000 visitors in its first year! 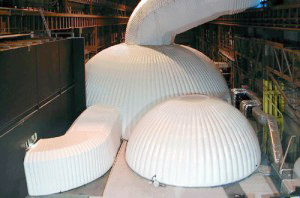 Magna Centre was a combination of three main inflatable structures all interconnected with air inflated fabric tunnels creating an interesting environment within the Magna Science Adventure Centre in Rotherham, UK.